Dozens of figs had swelled to a purple mass, soft to the touch, and desperately hanging on for dear life. Literally, it was a race with the birds. The ripest fruits were already pecked to death, left hanging to taunt us in what we did not discover in time. Birds had wings, but we had sticks. As I was warned, you had to be careful when you picked the figs from up high as they leaked a white sticky sap when broken free. I stood on my tip toes, arm fully extended, beating the figs free from their roots. I wanted those fruits, badly. I had at least a week to burn while waiting for Brad to maneuver Nacho’s new transmission back in place plus a laundry list of other projects to increase Nacho’s mojo. Each day, I would start by running through the eucalyptus trees and alongside the fields of grazing cows and corn fields. At my turning around point, I would stare out at the countryside in utter disbelief of its beauty. My thoughts often led to the general ideas that most Americans had on this country: cocaine and violence. There is no denying that both of these things exist, but often not known is how little this represents Colombia as a whole. After my mind stopped wandering, I’d continue on, stopping to greet the many families of baby cows and the truck driver I saw daily, as he dropped off his workers to tend to the sheep. When I returned home, Brad was already to work on the vehicle and would stop briefly when I yelled breakfast was ready. For the remainder of the day, the Olympics played in the background while painted, basked in the sun, watched the cows, cooked, wandered through the yard, or kept Brad company. 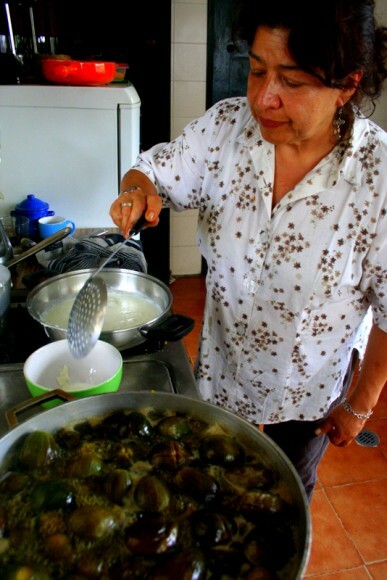 A few extraordinary days occurred in the mix, and that was when Constanza and Hernando took the time to show me how to cook up some local dishes. Before we left Susacon the first time around, I attempted to cook dessert figs. I failed horribly and realized I needed some expert advice. 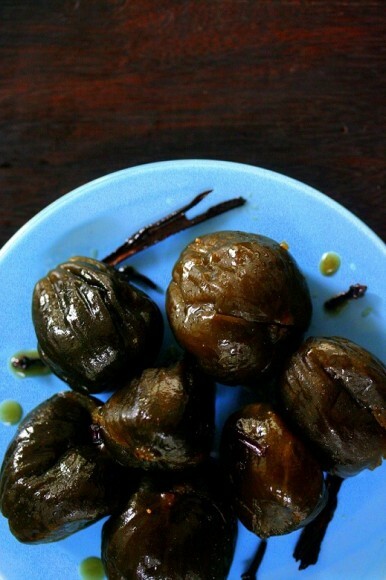 Cos accepted the role and tutored me on how to cook figs in sugar water, infused with cloves and cinnamon. 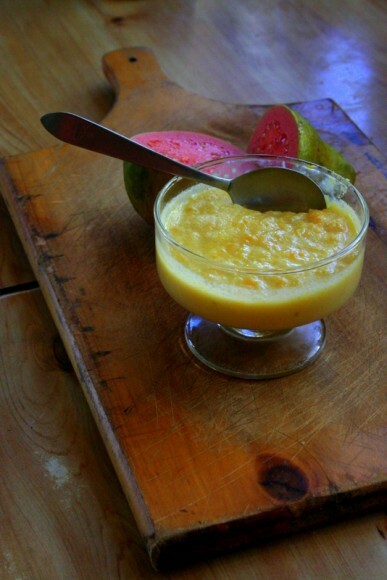 While the figs simmered, I learned how to make a custard dessert as well called Postre De Nata. 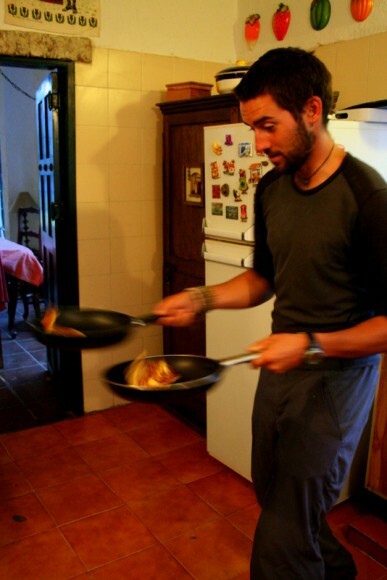 A few days later, Hernando showed Raphael (a French backpacker and instant friend) and me how to make Sarapas, a corn-based pancake. 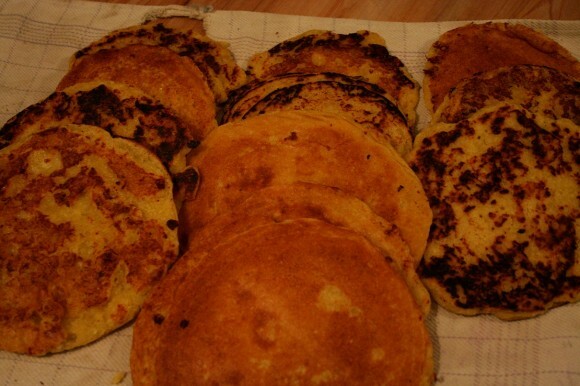 This variation was a close relative to the arepa, also a corn-based pancake offered on every street corner and home in Colombia. 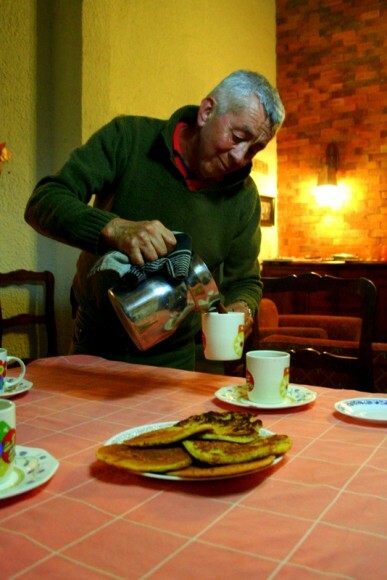 After we made a stack of a dozen or so, Luis made hot chocolate, also a staple in the Colombian diet. Yes, there is heaven on this earth. 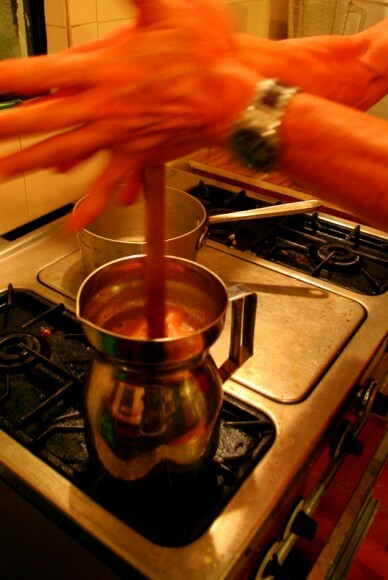 Next to the spatulas and spoons in the Colombian kitchen, there is a special stirring stick made solely for mixing the chocolate and frothing milk. Cut the stem off of each fig. On the opposite side create an X by cutting two 1″ slits. This will allow the milk juices to run out while cooking. In a large pot, add 6 inches of water and bring to a boil. Add the figs and reduce to a simmer for 10 minutes, or until the figs are soft. 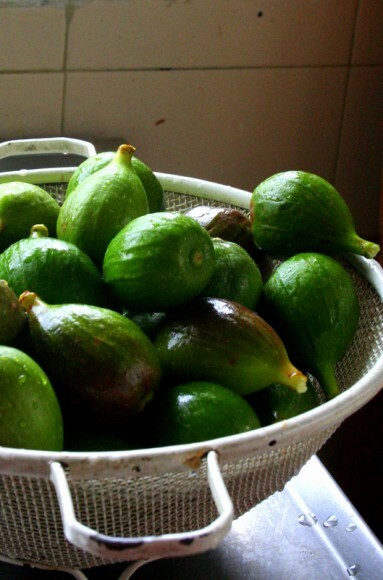 Drain the water while leaving the figs in the pot. In another large pot, add water (a few inches from the top) and bring to a boil. 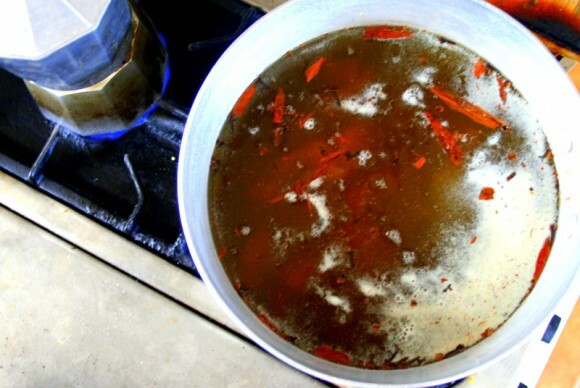 Add panela, cinnamon sticks, and cloves. 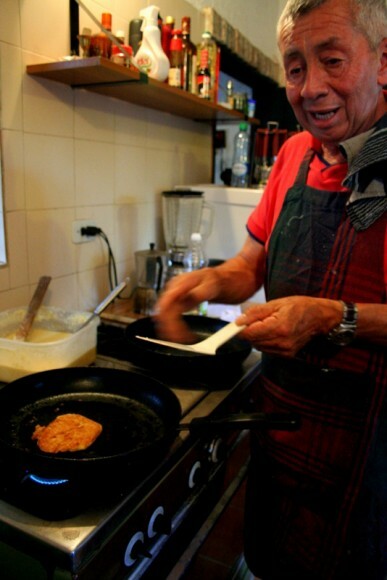 Cook until the panela has dissolved. Add the sugar water to the figs. 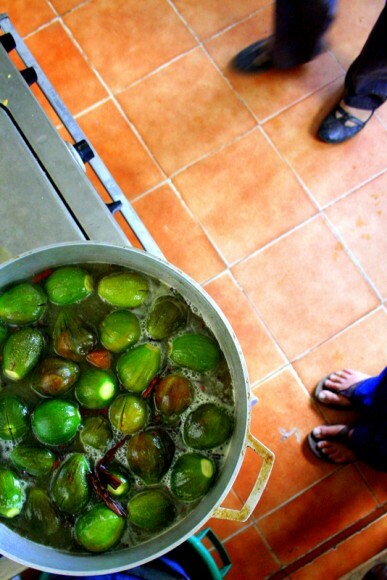 Simmer for 2+ hours uncovered, allowing the figs to cook and sugar water to reduce to a syrup. 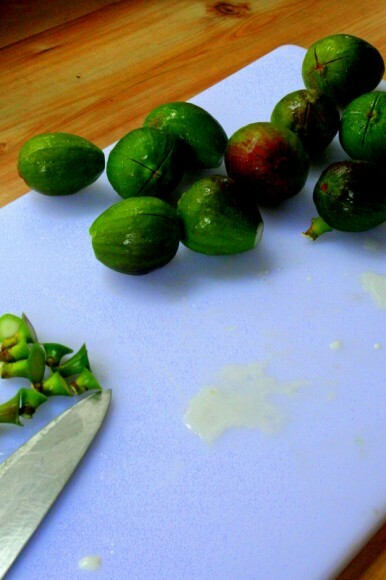 *If a fig begins to split, remove from the pot and set aside. *The figs will be done when their color changes from a green to a dark purple. 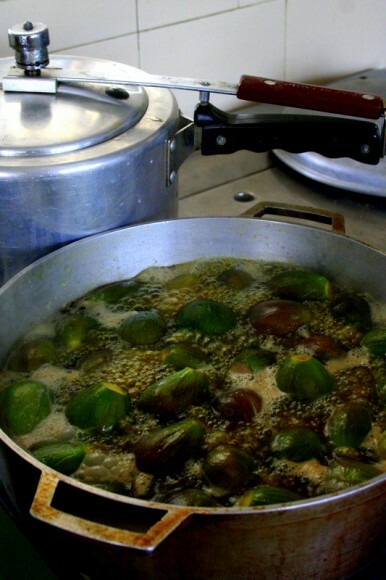 Recipe alternatives: Instead of cooking the figs in sugar water, you can leave the canela out and simmer just in water. 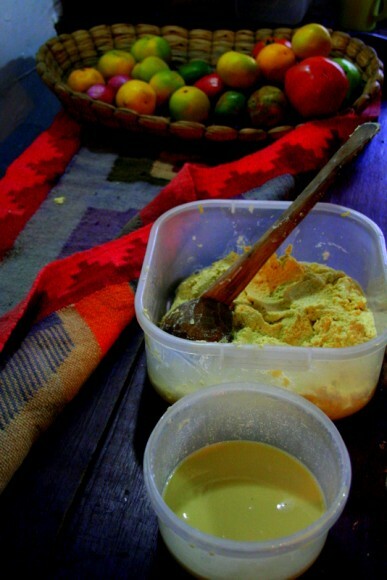 When the figs have been removed from the heat and cooled, fill them with arequipe (milk + panela). In a large diameter shallow pot, add milk and bring to a boil. Let the milk stand until a cream forms. This will look like a thin layer of skin on the surface of the milk. 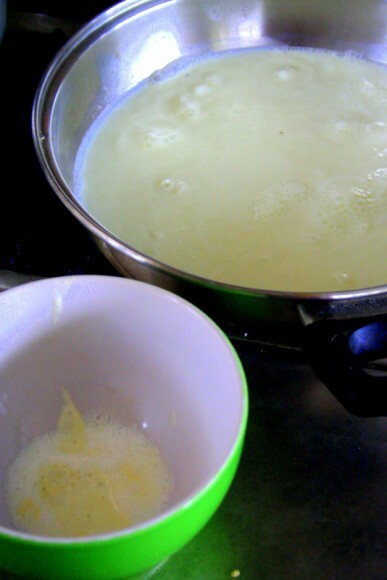 Remove the cream with a spatula and transfer to a bowl, repeating until there is no more milk cream. Try to remove the cream each time in whole chunks. 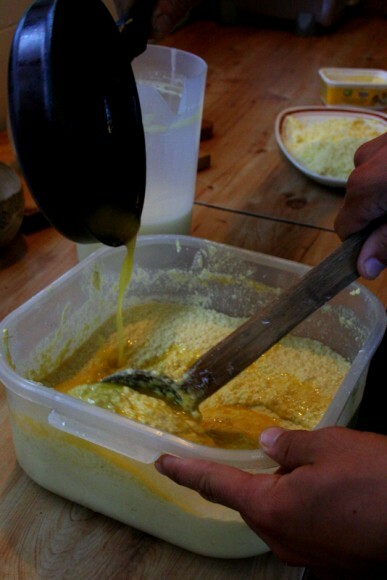 In a separate bowl beat the egg yolk until frothy and light in color. 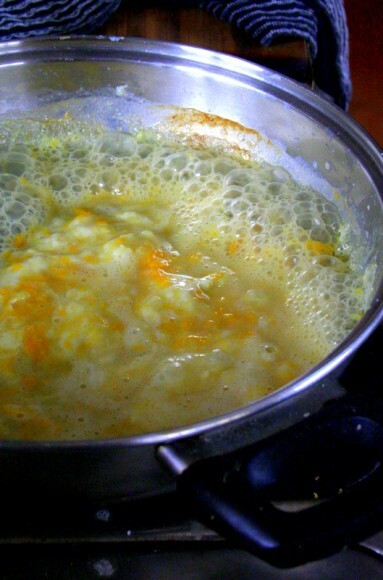 With a little milk left in the pan (1/4 cup or so), add the egg yolk and mix in a slow moving motion. Some solids will form from the egg yolk (this is fine). Next add the sugar and liquor and continue stirring. Lastly add the cream that was set aside. Continue stirring on low heat and remove before it boils. Pour into individual dessert cups. Let stand at room temperature for 30 minutes and then refrigerate. Enjoy when cold. *If you want to add a tablespoons of raisins, do so while combining the cream and syrup. 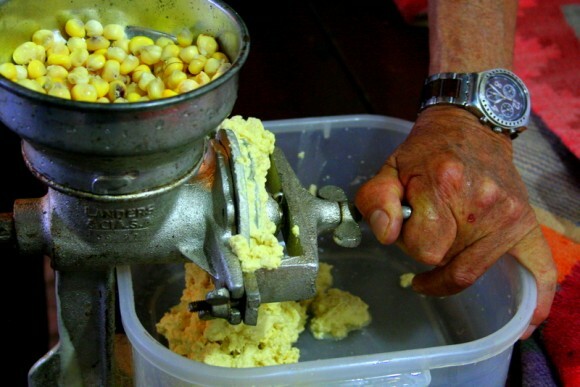 In a hand grinder (or blender), grind corn kernels to a thick paste. As you grind, a milk will drip from the grinder. Reserve the milk as it will be added back to the corn paste later. 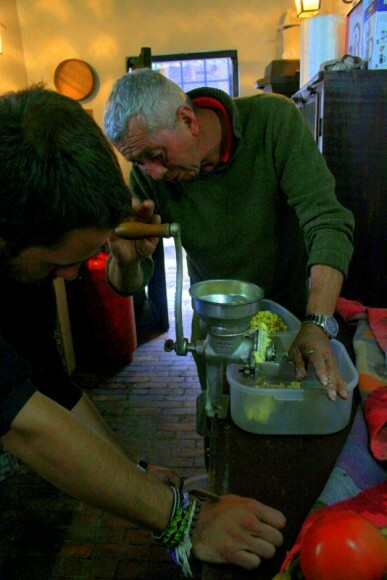 Once all corn has been ground, change the setting on the grinder to a finer setting. Process the corn through once more. The end result should be a liquidy paste. Next, add the milk and all its remnants to the corn paste. It should be somewhere around 1 – 2 cups. In a pan, melt 2 tablespoons of butter. Add to the corn paste in addition to salt, sugar, cream and milk. Once all ingredients are added, check the consistency. It should be somewhere between the consistency of pancake and crepe batter. If the mixture is too thick, add water. Whether or not you will need to add water will depend on the freshness of the corn. Fresher corn will produce more milk. I could almost taste the pancakes. This was a great segment. Hi, guys! 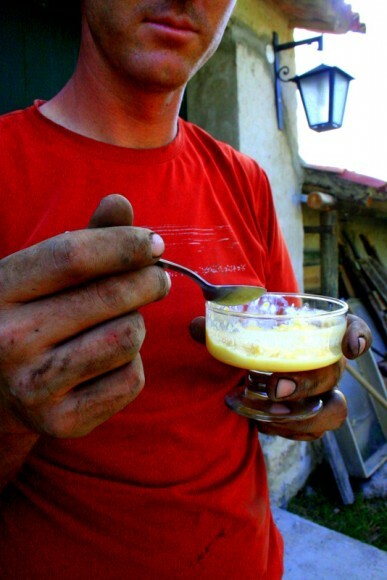 The VW repairs are interesting, but I can more easily relate more to the FOOD! yum. Sheena, is the Columbian hot chocolate like that found in Guatemala? Do you have a recipe for it? I would love for you to share one. Stay safe and happy. We will be missing/toasting you at the Sweeney/Norris wedding. 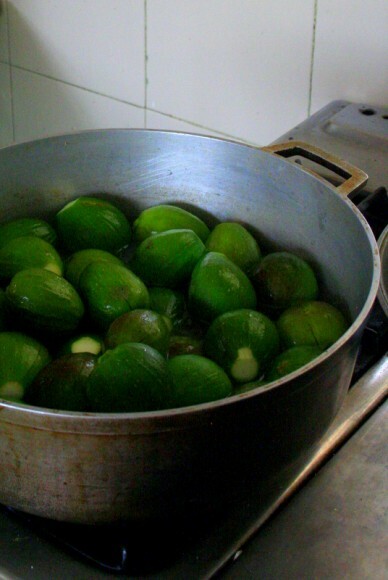 Regarding the fig recipe, is the water which was used to boil the figs, in the first step, used in the second pot, or is it discarded? Wonderful writing – enjoying all the installments here in the North of Scotland – especially “gearbox smuggling” and this one with added recipes! Sarapas sounds so good! Need to borrow your blender though :) Maybe in Chile? Also, can you post some good vegetarian dinner recipes, we need ideas!! Are the people who usually teach you these things, the hosts of where you and Brad camp at? Brad and I are DEFINITELY going to miss attending the upcoming wedding! Did Ryan ever tell you we saw him when we returned to Flagstaff? @Miguel: The first batch of water is discarded. Enjoy! @Kenneth: Yes, I’ve learned a number of recipes from the hosts of places we’ve stayed, and also from random people we meet along the way. 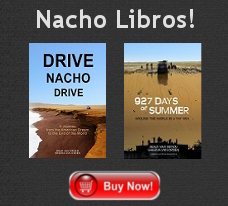 It seems to always be when we have a lot of down time (Nacho repairs)! We always seek out markets for good local food, and sometimes I’ll ask the cooks about the food (what’s in it/how it was made) and then follow it up with internet research. Grandma had two fig trees in the backyard when I was growing up and I remember well the race with the birds and the white sap that was itchy on your skin. I don’t recall ever picking or using the green ones though. Continue your journey, enjoy immensely and remember us poor cubicle dwellers as you go. Thanks Sheena and good luck….looks like Nacho feels better!